Sometimes, there’s a benefit to waiting. I was prepared to be super dead honest about my “income” as a poker player–not what I neccessarily made but the very high amounts of my take-home from time to time–before a tax professional wisened me up. I still owe (I had two simultaneous jobs in 2014), but we’re talking hundreds… not thousands. I fancy this as a good thing. The benefit to waiting on crowning an MVP? As recent as three weeks ago, this was a four-man race. But, let’s be real: despite what J.R. Smith and Kevin Love think, we’re back down to James Harden and Stephen Curry… pretty much the way it’s been for 75% of the season. And with the type of qualitative analysis only I can bring you, I’m ending the debate today, damnit. 1. If you were a kid looking to be uber cool… or a 32-year-old man with a shoe fetish… whose shoe would you rock? This is an important question. 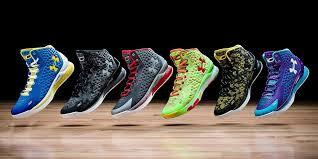 If you’re the MVP of a league that generates gazillions in sneaker sales, your kicks better bang. 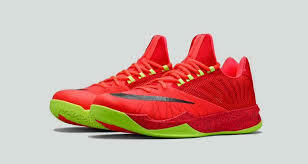 In Harden’s defense, yes, there was more than one color available, but those red ones would probably be the only ones I’d rock. For Curry, inevitably I’m going to grab at least one pair (and like a responsible adult, yes, I’m waiting for the price to go down)… but the struggle to determine which pair to get is real. You can ask my girlfriend about my daily internal debates. The viable color options… and from a more practical standpoint, the ankle support (no way Cadence ever balls in lows… ever), this one’s easy. 2. Who had the best commercial of the year? I enjoyed the idea of the “Chicken Curry”, but I really, really appreciate Harden’s whole “I’m going to take a well-known deficiency of mine and make fun of myself.” It’s like he roasted himself, which I’m sure Curry could do, but because Harden pulled it off (he must have prepped with Martha Stewart), gotta go with The Beard on this one. And fine, I’ll stop with the fluff. I promise. 3. You have $1 million riding on an NBA 2K game played out in Blacktop Mode picking against a friend. Who do you pick first? This is where we can get a little real and say this has been a transition year in the NBA. Kevin Durant, last year’s MVP, has been hurt (although here were his stats while he was playing through various injuries and “figuring things out”: 25/7/4, 51-40-85), and the previous incumbent LeBron James has looked mortal (yeah, but at 25-7-6 I would still go to “kombat” with that mortal… see what I did there?). That said, with a million on the line I’m probably taking those two first. But next? Without a doubt, Harden. Impossible to stop from getting to the rim, and maybe a little overrated athletically once he gets there. Plus, virtually, he’s pretty much just as good of a shooter as Curry because he has a smoother release. I’ve been much streakier with Steph online because his release is almost herky jerky in the game. Again, further proof that no one can shoot like Steph… except Steph. 4. You have $1 million riding on a real life pick-up game and you’re picking against your friend, and as incentive to make sure that nobody loafs around like it’s a preseason game, the winning team gets $20 million to split amongst themselves. Who do you pick first? And I think the answer to this question is just as easy as the previous… even if the answer is different. It’s not like Harden has failed in the big moment. But it seems like for the last three seasons, Curry has LIVED in the big moment. His transformation from a break-even player in the clutch to a clutch deity has been ridiculous. With that jumper and his ability to get others involved, no way I look in any other direction. You know what weakens Harden in this setting? The fact that there aren’t any shooting fouls. His scoring is padded by his ability to get in the lane and cause contact. I look at his box scores and consistently see 14-16, 12-12, 10-11, etc. In a regulation game, you want a guy like that. In a pick-up game, you’d literally shoot a guy who called that many fouls. Plus, assuming you pick LeBron first and your friend takes KD (or, depending upon your mindset, assuming you punt your first pick knowing your boy will take LeBron when you wanted KD all along), Curry is a no-brainer because he meshes better. In a way, Harden is redundant to both LeBron and KD because he’s ball dominant. Curry can thrive on or off the ball. 5. Take Curry off the Warriors and Harden off the Rockets. Who falls harder? Shaun Livingston could conceivably be the Dubs starting point guard, and I still think the Warriors would make a push for the 8th spot. On a team without Curry, Klay Thompson would probably make a push for between 25-27 points per game, and they defend well enough to be in every game. But this is probably the argument that most Harden fans use: without the Beard in his dangerous but cute low-cut shoes, the Rockets would be fitting Jahlil Okafor or Karl Anthony-Towns for jerseys. Before Dwight Howard came back, Harden’s pretty much had to rely on Trevor Ariza as his “second banana”. He’s had to do sooooo much to keep Houston viable, and they are very much alive for the two seed in the impossible Western Conference (of course, San Antonio is in the middle of a ridiculous “K… it’s time to start playing again” run). I still think it says something about being the best player on the best team… but this is an easy win for James. 6. What if you put either of these guys on the Knicks as currently constructed? Would they make the playoffs? And by “currently constructed” I mean without Carmelo Anthony (and while I’m here… what kind of dude is healthy enough to play in the All-Star game and then decide to “shut it down”? Just saying). Notice I didn’t use the Lakers or T’Wolves because… yeah… it’s the West. Anyway, if Isaiah Thomas could have that significant of an impact on the Celtics, what about Curry to the Knicks? Can you imagine Steph’s scorgasms and how they would affect THAT arena? Curry could literally save Andrea Bargnani‘s career playing pick and pop basketball. Jose Calderon and Curry might be diminuitive, but they would also be the most intuitive back-court in the NBA. Steph would have a poor man’s Klay in Tim Hardaway, Jr. and a mini-Harrison Barnes in Cleanthony Early. Jason Smith is like a stretch-five version of Andrew Bogut. How do the Knicks NOT make the playoffs? Holy crap, I just wrote a positive paragraph about the Knicks… and it was all because of Curry! As for Harden… he could have a similar affect… but the difference between the Rockets’ role players and the Knicks’ role players is that Houston’s role players know their limitations. Guys like Hardaway, Jr. and Early are still figuring them out… and Bargnani still thinks he’s a max player… or at the very least has women whispering in his ear that he is. I have a feeling Curry could reign all that in while Harden might not be able to. Besides, the Knicks know what it’s like to have a dude playing “hero ball” for 20 seconds of a possession. It works in Houston… don’t know how well it would play in New York. 7. Justin, seriously… at some point I have to get back to work. Can you end this thing and tell me who the %+! @ the MVP is? It’s documented who my favorite player in the league is. Everything about Curry is awesome. He’s a guy nobody recruited, and then when he blew up in college, nobody (to a point myself included) thought he’d be able to get his shot off against NBA defenses, and the fact that we’re even having this discussion is awesome. Hell, I just found out that he’s an Express model, and I love Express. But you can’t overlook what Harden has done for his team this season. The 26-7-6 don’t even tell the whole story. He’s taken a lottery team, put it on his back and could very well end up as the 2nd seed in the West just in time to get their assss beat by a rejuvenated Dallas Mavericks’ team that was built for the playoffs. I love you, Steph… but this season Harden is your MVP.